Opinions have been sought, debates held, pros and cons weighed up, and one epoch-shaking decision has been taken. Yes folks Telltale’s summer reading has been finalised! 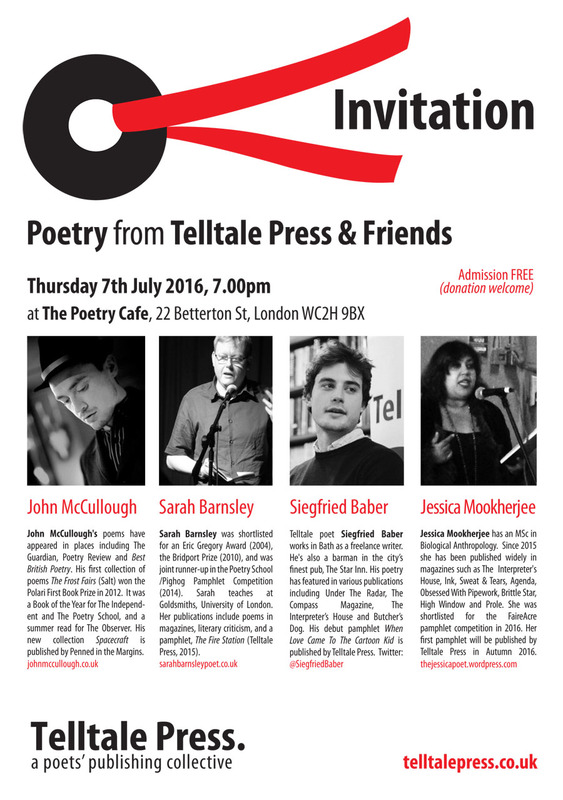 It will be held at our old stomping ground of The Poetry Cafe, in London’s Covent Garden. It’s all the sevens: the evening starts at 7:00pm, on Thursday 7th July. Hotter than a sizzling hot thing, is John McCullough right now. He’s a long-term Telltale friend, and his spanking new collection Spacecraft is already going down a storm. On the night we’ll also showcase Telltale’s latest recruit Jess Mookherjee, whose collection Telltale will be launching later this year. You’ll also find on the bill are fabulous Telltale stars Sarah Barnsley (The Fire Station) and Siegfried Baber (When Love Came To The Cartoon Kid). Picture the scene… You are sauntering through sophisticated Covent Garden, and effortlessly drift into the Poetry Cafe. Soon you are congratulating yourself on choosing to hear some exceptional poetry. All for free.